Thank you sweet baby Jesus for restocks. I was not in the market for another highlighter palette but after seeing a few swatches I added it to my cart. This palette originally launched with the “Yes Please” eyeshadow palette-which is why I was on the site in the first place. Both palettes sold out in record time but they were restocked once more. Unfortunately, I did not get my hands on the eyeshadow palette. Nonetheless I got this gem and I am ready to share the deets. I already own a highlighter or two from Colourpop but they are that wet, moussey texture that we know and love from them. This palette introduces six highlighters in a new pressed pan format. The palette is super compact and sleek. 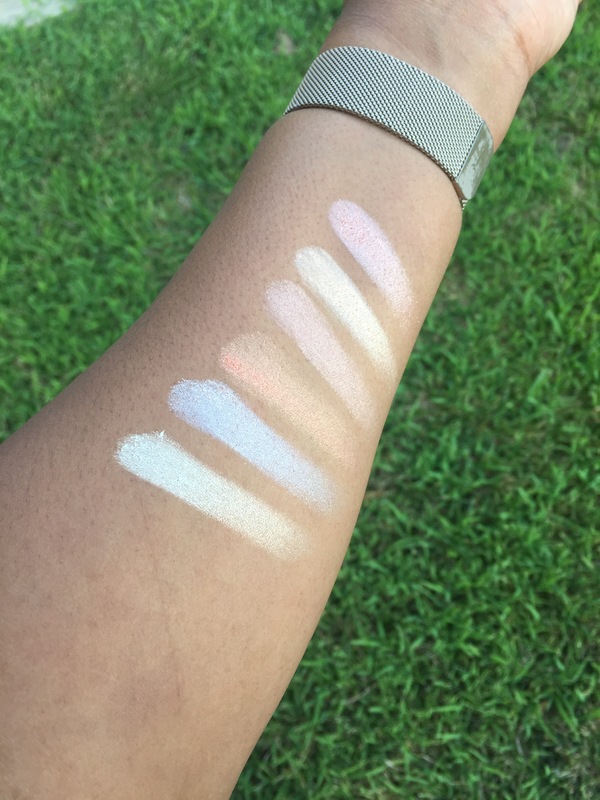 The six highlighter shades are housed in a white hard, magnetic cardboard case that reads “I Like Your Face”. The sleeve is a neon coral and honestly I like the packaging a lot! 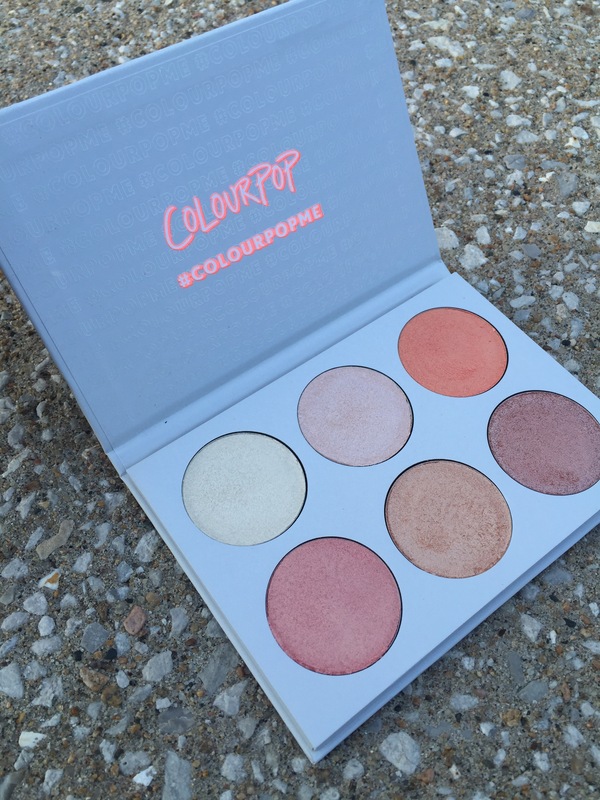 It screams fun which is always the vibe I get from ColourPop. The shade names are listed on the back of the palette versus being listed beneath each shade. It’s kinda a downsize for me but it’s the only con I have with this palette. The shades selected for this highlighter palette reminds me so much of the ABH (Anastasia Beverly Hills) Nicole Guerriero Glow Kit collaboration. Each pan holds 3.6 grams (0.13oz) of product. These pans are slightly smaller than the pans in Nicole’s Glow Kit; which holds 4.5 grams (0.16oz) of product in each pan. However Colourpop’s “Gimme More” palette retails for $18.00 and ABH’s glow kits retail for $40. I instantly fell in love with “Full Service” at first glance but, after swatching them all; it’s “Bottomless” that has my heart. These highlighters are seriously pigmented and makes me wonder how ColourPop can achieve such greatness at such a low cost. They are not super glitterly but can come off a bit chunky. Although I only experienced chunkiness when swatching with my fingers. I used my handy dandy A23 brush to apply these to the high points of my face and everything was good. Since they are crazy pigmented I suggest you use a light hand and build it up to your liking. This palette is still available on ColourPop.com and you should buy it right now. There is definitely a highlighter shade for everyone in this palette. Also if you are interested in the “Yes, Please” eyeshadow palette it will be restocked July 27th at 10am PST for $16- I know I will be on the site trying my luck. Thank you so much for reading. Please comment down below your thoughts if you have this palette!